You're a Professional Advisor who helps other businesses grow. But why is it that you're still subjected to chasing potential clients to make a sale… and if they do call you back, they treat you as if you are just a "vendor" or one of many choices…that is not the respect you deserve. The advisory market has been flooded in the last 24 months with thousands of new advisors going after YOUR next client. Many are not as qualified as you, some loosely call themselves "coaches" without the same solid business background and credentials as you…but that doesn't matter, because your next client is going to have a very difficult time making a distinction between you and them. Search LinkedIn under "Advisors", there are thousands….and more coming online every day. If you think that you can keep doing what you are doing to stay ahead of the curve and win your next clients the way you have in the past, you're in for a rude awakening. For years, ever since my business went global as Unlock The Game® became a worldwide success, many of my private clients who were also Professional Advisors like me, kept asking if they could take a "peek" under the hood of my business to see what my formula was for the way I positioned myself and my business so that I could essentially become a CATEGORY OF ONE – incomparable to anyone else in my market. You see, most Professional Advisors are frantically doing what I call "random selling"… meaning everything they're "supposed" to do to feel like they are doing the best they can like: networking (not predictable or leveraged), referrals (not systematic or scalable), social media (not targeted lead generation), online content publication (the illusion of authority), and hiring new staff (huge fixed cost investment when they don't bring in new business). One thing I hear a lot of Professional Advisors and Advisors say is: "If I can get in front of the right person, selling is natural and easy and usually the potential client comes on board. The problem is, my solution is perceived as a commodity -- which makes it extremely difficult to get myself in front of a steady stream of qualified potential clients who see me as different." Coming up March 25 and April 01, 2019, I'll be hosting an exclusive Trusted Authority Summit® were I'm going to share with only 25 qualified hand-selected Professional Advisors, my Trusted Authority formula that up until now, has only been available to my Private Client Group. If you're like the many Professional Advisors I mentor every day, referrals as a main new client source is drying up, fast. Sure, referrals to come in, but the flow is slowing down to a trickle for many. Everyone knows a competent Professional Advisor these days. Go online and there are hundreds within 25km of where you work. Over the last decade, as a Professional Advisor myself, I've seen the world change and I made sure I was ten steps ahead before any change affected my business. In the US, success and authority status in the business world is celebrated. In Australia, for many Professional Advisors, it's something they have never dealt with head-on, broken down and come out the other end without guilt and hesitation. Many Professional Advisors believe that "self-promotion" is beneath them. They know that if they were the author of their own book (physical book, not e-book, anyone can do an e-book), their inner voice might say to them "who do you think you are stepping up and becoming an author of your own book – displaying how good you are and how much you know?" These are Professional Professional Advisors who pay me every month to keep them positioned as a Trusted Authority in their market so they have a continuous flow of high-quality leads so they never have to worry again about finding new clients. You'll have clarity on the messaging, branding, positioning and sales process to engage your market in a completely different way...as a Trusted Authority, not just a advisor who does what others can do. We reject many applicants (even if they want to pay the enrolment fee), who are not business advisors or are "tire kickers", not serious about re-positioning themselves and their business for growth. Simple facts: the business advisory market has been completely commoditised, pushing consulting fees down to their lowest levels ever - with no barrier of entry for anyone with a resume, claiming to be an expert in their field - using online "smoke and mirrors". If you have an ambitious flame burning inside of you, if you feel you are not fully monetising your years of hard-earned business experience, then nothing is more important that you immediately attending the next Summit. 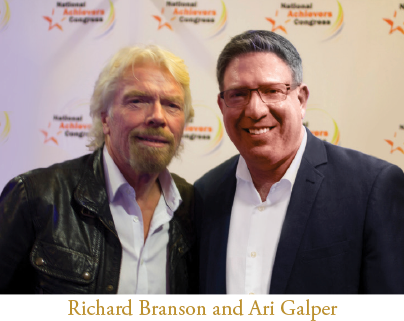 Ari Galper is the World's #1 Authority on Trust-Based Selling and the creator of Unlock The Game®, a new sales mindset and approach that overturns the notion of selling as we know it today. With over 74,433 subscribers and clients in over 35 countries, Unlock The Game has become the most successful Trust-Based Selling approach of our time. In a day and age where technology rules the selling world, for many growth-oriented business owners and sales advisors, authenticity and trust have taken a "back seat" to the sales process. His new book "Unlock The Sales Game" has become an instant best-seller among professional advisors and advisors across the globe. Ari has been interviewed on major news networks such as CNN/Money and SkyNews and is a sought-after international business mentor for professional advisors and advisors. "Ari has proven and tested systems that are growing my consulting business!"